(Bloomberg) -- Tech is back, and it couldn't have come at a better time for Asia. 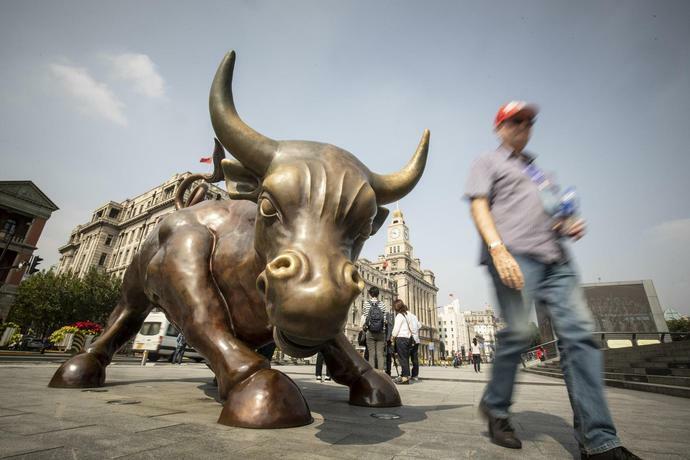 With optimism for a quick U.S.-China trade deal starting to fade as the two sides haggle over the specifics, stock markets in the region need all the help they can get to keep the good times rolling. And it's tech again that's coming to the rescue. 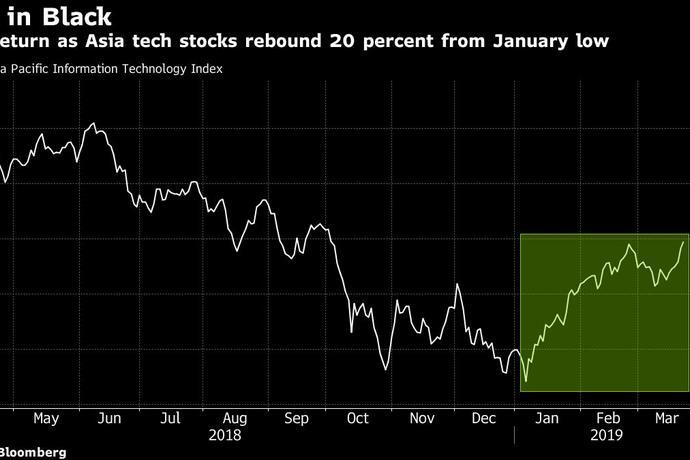 Technology companies in the MSCI Asia Pacific Index have led the charge this week, taking their rebound from a January low to 20 percent. The sector is also back to being the biggest gainer for the year. While tech is Friday's highlight, investors are also still parsing the implications of the Federal Reserve signaling Wednesday that it will hold off on interest-rate increases this year, due to concerns about the slowing U.S. economy. On the one hand, a weaker greenback is positive for emerging-market economies in the region, but on the other, a stalling U.S. engine is bad news for global growth. The Fed's more dovish stance does open the door for Asia's central banks to potentially cut rates. "For the rally to continue, the most important thing we're watching for is whether the global economy starts responding to a mostly dovish Fed and ECB, and more stimulus from China," Tai Hui, chief market strategist for Asia at JPMorgan Asset Management, said at a press conference in Hong Kong March 21. If PMI numbers "continue to stabilize and even pick up as we move towards the summer, I would think this rally can continue." Leading the way for tech, giant Samsung Electronics Co. and Taiwan Semiconductor Manufacturing Co., which collectively account for about a third of the MSCI Asia Pacific Information Technology Index, have advanced 4 percent or more this week to join a wider rally in global chip stocks. The sector jumped overnight in the U.S., driving a 3.5 percent advance in the Philadelphia Semiconductor Index as it came close to the peak it hit a year ago. Micron Technology Inc., the largest U.S. maker of computer-memory chips, reported quarterly results ahead of analysts' estimates while also announcing plans to cut production in response to a slump in demand. "While the production cut is not significant in absolute terms, we believe Micron's action is positive for the memory industry as we expect it to lead to a market reassessment of the current concerns," Peter Lee, an analyst with Citigroup Global Markets Inc., wrote in a note to clients. The picture is a bit different for two of the most prominent Hong Kong-listed tech stocks, with both Tencent Holdings Ltd. and Xiaomi Corp. reporting a mixed bag of earnings this week. Smartphone maker Xiaomi actually bested analysts' forecasts, after raising retail prices, revamping its budget label and expanding overseas. But it hasn't been enough to convince investors the company is on the right track as it's still struggling to compete in China's plateauing smartphone market. The stock posted a fourth weekly loss, extending its decline this year to 13 percent. --With assistance from Gregor Stuart Hunter. Uber Technologies Inc said on Wednesday the head of its Asia-Pacific operations will leave the company at the end of next month, and will be replaced by Pierre-Dimitri Gore-Coty. Amit Jain had joined the app-based ride-hailing company as its India operations chief in 2015 and had taken over as head of Uber's Asia-Pacific business last year. The company, which recently unveiled its IPO plans, said https://ubr.to/2vjtq22 Gore-Coty, who heads its EMEA rides business, will also take charge of the Asia-Pacific business.